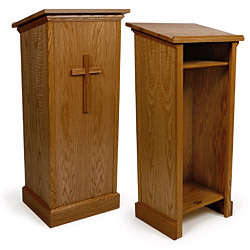 These dark oak pulpits with a cross on the front panel are made of solid wood and plywood for a fabrication that will last for years. 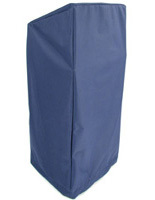 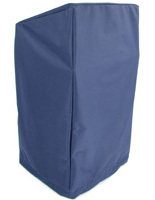 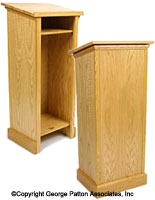 The lecterns come with a large storage area for holding presentation supplies. 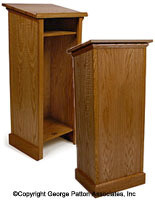 Each of the dark oak pulpits also comes an angled reading surface that measures 20" x 16.3". 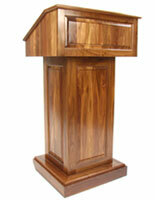 The podiums with a 7" x 12" front panel cross make great presentation furniture for religious stablishments and events. The oak pulpits are easy to assemble and only require the reading surface to be attached to the body with (4) included screws. 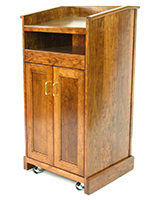 The wood lecterns feature a water resistant coating that helps them keep their finish.